I have been an arts educator since 1987 working with students from Universities and Community Colleges, Developmentally Disabled Adults, inmates at Folsom Prison, Adolescent Prisoners and High School, Elementary and preschool artists. In 1995, I received the Fellowship for “Visual Arts – Artist in Education Award” from the Sacramento Metropolitan Arts Commission for my efforts in teaching art in the community. My main goal as an arts educator is to help people to improve their artmaking and art-thinking skills.... I share some technical approaches to artmaking and discuss a variety of ideas /aesthetic considerations that I keep in mind while working on my art... I also use slide shows, text books, videos, gallery and museum visits but rely primarily on the exploration and experience of working in the studio.. Conducted ''Action painting'' workshop at Estonian Kunst Akademia, Tallinn, EST., January. Performance Art Workshop with students at SVEFI Community Arts School, Haparanda, Sweden, March. "ARTBOAT WORKSHOP" at Hirvitalo CENTER FOR CONTEMPORARY ART, PISPALA, Tampere, Finland, July. "More Action Painting," Introduction to approaches with "WET" Paint and continuing investigation, EKA, Tallinn, EST., December. Performative Mono-type Workshop: " Many Offerings: In the Air, by the Sea, Time Capsule and purified by Fire.... at Estonian Kunst Academia, Tallinn, EST. September. Jeju Island Art Camp, Artcar Workshop, Seoul, South Korea, September. “Intensive Painting Focus; AN AMERICAN FRIEND,” workshop at EKA, Tallinn, Estonia, January. Lead artist for “ARTCAR WORKSHOP” at Kankaanpaa Taideokoulos, Kankaanpaa, Finland, November. Please see newspaper article on the workshop; http://polyfonia.samk.fi/lehti/?p=904. Lead artist for “ACTION PAINTING” workshop at the Estonian Kunst Academia, Tallinn, Estonia, October. Lead Artist at Korean Experimental Art Festival 2011; “Artcar Making Workshop,” Seoul, South Korea, July. Lead Artist in Found Object Workshop; “COM-POST MODERN SCULPTURE FOR THE AVANT GARDENERS II,” Voipaala Art Center, Saaksmaki, Finland, July. Lead Artist in a “Performance Art” workshop with students from the Estonian Kunst Academia, Tallinn, Estonia, June. Lead Artist in Artcar project for “HUNGER PERFORMANCE FESTIVAL,” OPENSPACE/ Voxsluxus, Program Diverse Universe 2011, Berlin, Germany, May. Lead artist in “Found Object Sculpture Workshop;” “COM-POST-MODERN SCULPTURE FOR THE AVANT GARDENERS.” Center for Contemporary Art Pispala, Hirvitalo, Tampere, FI. July. * Here is a link to an interview about me and the artist workshop I conducted in July, 2010 in Tampere, Finland by Finnish artist Kristiina Sario. Conducted Artcar Workshop for families at the Children’s Artist Workshop, at the Children’s Grand Park / Sejong University Subway Station; Seoul, South Korea. October. Lead Artist in workshop to create First Artcar in Estonia with NONGRATA Group Artists for the 2008 Diverse Universe International Performance Art Festival, Tammiste, Estonia. May. 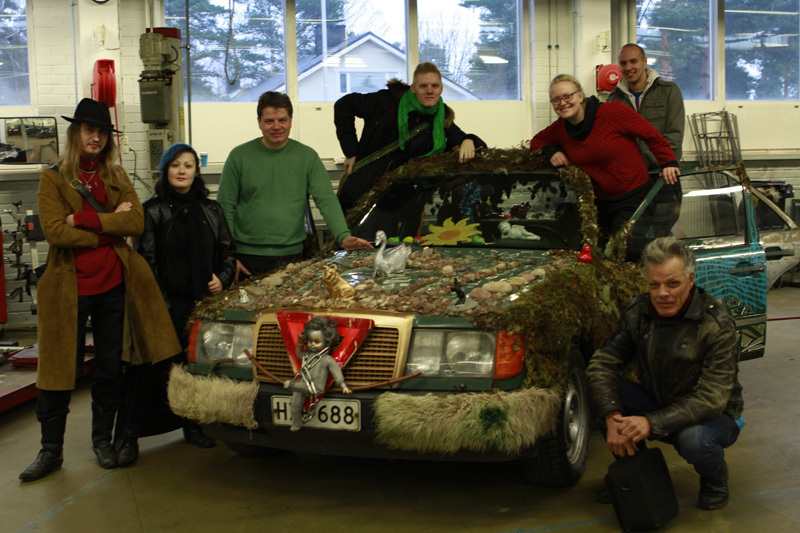 I enjoy conducting artcar workshops in various communities around the globe. This creates a wonderful opportunity for me to come into a community and share my knowledge and talents and to get to know and work with the various members of the community…. When creating an artcar you can collaborate with artists from the community, children from the schools, senior citizens who live in retirement centers, teenagers from youth activity centers, as well as students working in various art academic settings; grade schools, high schools and university settings… We collaborate on the artcar together, the design and materials for a determined time. For these projects it requires an automobile, welders (if possible), metal and other materials such as silicone, paints, spray foam, wire and various found objects to adhere to the interior and exterior body of the car. The found objects can be objects brought from the homes of the participants or purchased from neighborhood thrift stores/ 2nd hand shops, or can simply be rocks, broken glass, sticks or any fodder found in the immediate environment. All necessary permits need to be arranged by your Organization if you decide to take the car onto the roadway. In America it is only possible to bring an artcar out onto the streets when it is fully functional and street legal; lights work, turn signals, etc…. it is currently Registered and Insured, other than that most anything goes….. I have noticed from my interactions on the streets of Europe that the police have a tendency to check the license of the driver, insurance and registration……. I realize that it may not be possible to get all of the desired materials such as welders, but hopefully the budget that we have to work with will be ample to secure much of the needed materials… Artists always work with what they have available, this is part of our art making process…. I enjoy the process of making murals on blank and often forgotten and neglected walls..
better with the addition of artwork. The ideal time for this workshop would be one to 2 weeks..... Number of participants??? We shall explore some techniques and concepts of painting that dates backs thousands of years from the seminal Chinese text : The Mustard Seed Book of Painting… which helped to expand one as to what the simple concept of what a brush stroke can be and mean…… Through both Chinese and Japanese philosophy the simple brush stroke has been a metaphor for more then what meets the eye….. to more modern ideas about post-atomic art and life…. that shaped and formed the artform into what it would eventually become. incorporating live models into our repertoire…… The veiled paintings of Paul Jenkins and Morris Louis also provide some available technical approaches to the problematic ways that are available for painters……. A variety of techniques and materials will be explored. I love this stuff personally, very much…. Students will be introduced to a basic vocabulary of ACTION painting and learn to paint from observation and from their imagination. Students will be exposed to the classic masters of abstract expressionists and their wide variety of approaches and styles from the past in order to make available to them the wide range and variety of historically significant approaches in dealing with this medium of “wet color,” in hopes that they might ultimately develop their own vocabulary and some day ultimately find their own voices and language of art. How to make something beautiful out of a pile of discarded “junk” ?????? students to ponder and utilize in their own artworks…..
of the majority of the reference materials for the lecture/ classroom portion of the coursework…..
a) “in-studio/ 4 wall/ white cube/ gallery space” workshops and performances…..
b) Site specific works at various locations in and around the city at a variety of public spaces…. FOR SEVERAL HOURS PERFORMANCE, DO THIS, THEN THIS + THIS PERFORMANCE, STILL PHOTO & VIDEO PERFORMANCES.... LIVE WEB CAST TRANSMISSION PERFORMANCE. LONG OR SPEED DURATION PERFORMANCE... FOUND PERFORMANCE. RANDOM ACTIONS. possibilities of how to be inventive and create relatively fast images in the studio. The Duration of the workshops would vary depending on the Organization and available funding. create some beautiful sculptures that would be hard, durable and yet retain their light weight. exhibition at the end of the Workshop. direct to work with and is much cheaper and faster than stain glass. 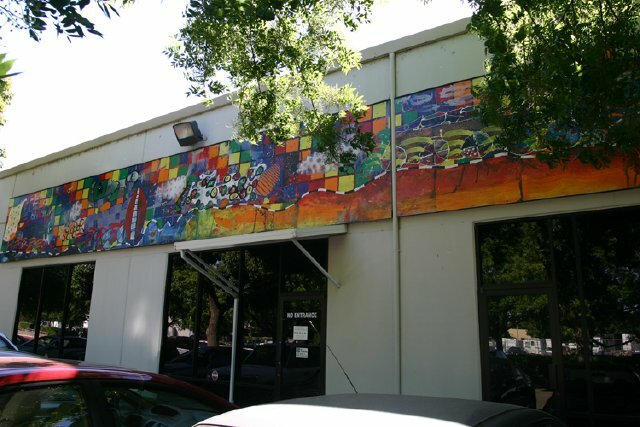 Commissioned to create Four Large Murals: 6 ft. by 100 ft. and 4 ft. by 80 ft. for the Sacramento Metropolitan Arts Commission’s Art in Public Places Program; Western Exposure at the Sequoia Pacific Warehouse Site.... Sacramento, CA. 1989,1999. Southern Exposure at the Sequoia Pacific Warehouse Site.... Sacramento, CA. 1999. Being a curator was a head and hands on result of running a gallery for 9 years; conceptualizing, developing, installing and promoting monthly art exhibitions and events at the Gallery Horse Cow. 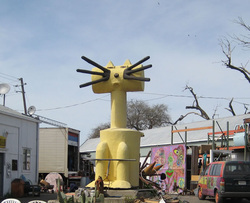 The Horsecow existed in Sacramento, California from the years 2001 until 2009. Horse cow produced monthly Gallery Exhibitions of SELF TAUGHT, OUTSIDER ART, ART BRUT, CONTEMPORARY SOUTHERN FOLK ART, ART CARS and the D.I.Y. Community of artists at large, including the Burningman Community of artists. We presented artworks to the community that had never been seen before. Later it evolved into including more contemporary regional artists, LOW BROW and other young and un-represented community artists in the Exhibitions. 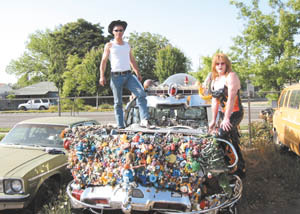 Here is a review from a local magazine; The Sacramento News and Review: http://www.newsreview.com/sacramento/content?oid=12076 . One key element in creating successful events is to know who you can work with and delegate responsibilities to. Identifying key players and trusted individuals who have the talent and ability in a variety of important details that need to be addressed in order to host a successful event is of paramount importance. Some people are good at promotion, setting up lighting, video projectors and sound systems, installing artworks, building flats for sets, security and door people, photo and video documentation; there are many diverse details that must be addressed and a great team of players is necessary and invaluable. In October, 2010 I organized an evening of performance art in Tallinn, Estonia at EAST CREATIVE SPACE featuring my friends and fellow performance artists: ROI Vaara and Philip Pedersen from Finland, Arianne Foks from Paris, France, Ville Karel, Meeland Sepp, Tuutu and Musicians IG NOIR of Estonia, CWO1 of "Cleaning Women" fame. Please check out “CLEANING WOMEN” video, some of my favorite musical performers in the world and great friends as well, they are based in Helsinki: http://www.youtube.com/watch?v=DCdMJtEjpDg . The evening also included a wonderful set by DJ JOJO200, Finnish Artist Johanna Sipila, who spins at the “Midnight Sun Film Festival,” in Lapland and is also from Helsinki. I MC’d the evening’s festivities and participated in doing both music and performance artwork. I am an expert in the field of Contemporary American Folk Art, Outsider Art and Art Brut and was the first person to present exhibitions of American Contemporary Southern Folk and Outsider Art in both Finland and Estonia, bringing some fine examples from my personal art collection to the Gallery 3 H + K in Pori, Finland in 2009: "AMERICAN OUTSIDER ART," and presented another selection of works: "AMERICAN OUTSIDER AND SOUTHERN FOLK ART," at the Center of Contemporary Art Pispala, Hirvitalo,Finland in 2010. For part of that exhibition, I met and lectured with my friend and colleague Erkki Pirtola. This is a webpage about Erkki and his artistic history in Finland: http://www.liveaction.se/ARCHIVES/LIVE-ACTION-08/ARTISTS/Erkki-Pirtola.html . Please See the VOIMA 8, 2010 article that Erkki wrote about me: http://fifi.voima.fi/voima-artikkeli/2010/numero-8/yes-yes-yes-right-on . Here is a video that Erkki produced about me, the exhibition and workshop that I conducted at The Center for Contemporary Art in Pispala in Tampere, Finland during the month of July in 2010…….http://www.youtube.com/watch?v=8y9ranl5SII . Seymour was the foremost expert on Folk Art environments in the world and worked with me for years advising me in my attempt to save Duke Cahill’s amazing folk art environment…. Duke and Francis Cahill were great friends of mine who at one time asked me to be their son, since they didn't have any family... I should have jumped at the opportunity while they were both alive.... They were the best!!! (TRUELY) I spent 15 years documenting and promoting Duke's environment, in hopes of having it preserved for future generations and ultimately lost the battle... His environment was destroyed along with much of his incredible artworks... (ONE OF THE GREAT DISSAPPOINTMENTS OF MY LIFE) This is a link to a website containing a story that I wrote about Duke Cahill’s folk art environment that was published in 1995 in the Sacramento News and Review. There are also some nice photos of Duke’s artworks. http://tomwhitney.net/dukecahill.html . This is a link to the S.P.A.C.E.S. Organization that Seymour ran for some 20 years: http://www.spacesarchives.org/ . This Exhibition was held at the University Library Gallery, California State University, Sacramento. In 2000, I was invited to become the curator of CONTEMPORARY SOUTHERN FOLK ART AND NORTHERN CALIFORNIA OUTSIDER ART for an online gallery based out of New York City, NEOIMAGES.COM . NEOIMAGES was one of the first art galleries to have extensive web presence on the internet in America. Institutions based throughout Northern California and the San Francisco Bay Area. In 1993, I conceived and curated the "EXPRESSIVE VISIONS" Exhibition held in conjunction with the E.B. Crocker Art Museum and the Dean Moniz Gallery both located in Sacramento, California. In 1988, I formed The Screaming Pygmy Orchestra; a VARIETY THEATRE based on the concept of the ITALIAN FUTURISTS Performance Artist Group. It was made up of 25 performers: several Performance Artists, Stand up Comedians, Spoken Word Poets, Live Experimental Music, Dancers and 5 musicians from Mexico. This project was both an important curatorial and performative project. The HORSECOW was an underground artist community that was the home of an art gallery, large community workspaces, artist studios and several illegal artist live spaces... So many artists worked there throughout our 9 year / 3 space run, that I won’t attempt to make a list of names because it would fill up several pages and I would be afraid of forgetting someone and would feel guilty and insensitive..... but the most important thing about the HORSECOW was the community; that a large diverse group of like minded people came together and made a place and a time very happening in so many varied creative ways... Allen and I constructed the original HORSECOW to be an art gallery and artist studio spaces with much help and efforts from our great community of artists and supporters. If it wasn’t for all of the people who put in the hours of toil and sweat, HORSECOW would have never existed... At first there were only a few of us and then the number of artists grew until we had a great and diverse collective. I was very fortunate to have Allen Denault as my great friend, business partner and Co-Director of HORSECOW. We collaborated on a multitude of physically and conceptually demanding projects throughout our great times at HORSECOW, and in retrospect the good times were legendary; some of the best times of our lives and far outweighed what grief and hard times we ultimately succumbed to. Allen was my main collaborator in the HORSECOW BOMB BRIGADE Performance Art Group. We performed at several galleries and art events throughout Northern California from 2004 – 2009. The HORSECOW BOMBERS were formed by a small group of like-minded artists, tech heads and pranksters who enjoyed working together on projects. We utilized a piece of technology known as a "Pulse Jet" as a key element of our performance actions. Our performances were literally explosive and could be rather scary and conceptually challenging for the viewer...... We remained open to collaborating with artists from the art community and worked with visiting International Performance Artists. Our interactive performance artworks were based on audience participation and were fun to become involved in both as a participant and a spectator. 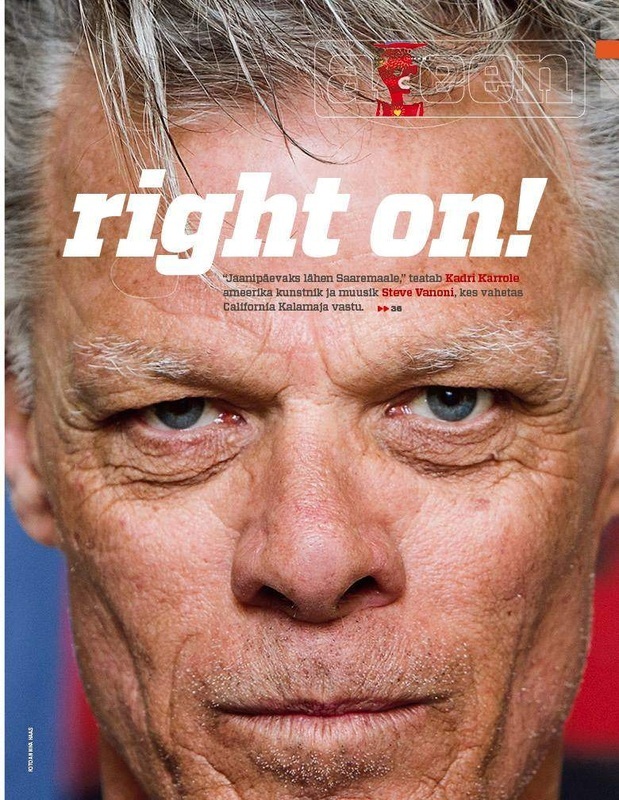 Please see accompanying article: http://www.newsreview.com/sacramento/content?oid=587534 . HORSECOW consisted of a great group of “artists” who came together and helped to create some very wonderful and magical evenings…. PLEASE CHECK OUT THE VIDEO LINK BELOW TO GET A TASTE OF WHAT ONE FASHION SHOW WAS LIKE FROM ONE OF THESE EVENINGS IN 2004.http://www.youtube.com/watch?v=9ltmWrk2q6U&feature=related. One of the most important functions of HORSECOW was to provide affordable artist studio spaces in Industrial, off the beaten path locations because of cheaper rent and the warehouse spaces were located away from residential neighborhoods. This allowed us to the freedom to work without disturbing neighbors or being disturbed by them…. We were fortunate in our 9 year existence to have some beautiful and amazing spaces. Here is a video that was produced by a visiting Italian rock band “JENNIFER GENTLE,” that captured a special time at our last location of the HORSECOW 3…… http://www.youtube.com/watch?v=iWjba-hb240… Please check out the video to get a sense of the beautiful place that we once had. Unfortunately the HORSECOW was tragically lost in 2009 while I was touring with NONGRATA; see article: http://www.newsreview.com/xsacramento/content?oid=1050483 . Allen and I built the 1st Gallery HORSECOW in Sacramento, California in 2001 with the help of many artists and our great friends from the community. We managed the operation there for app. 4 years, were much loved by the art community and eventually a rich real estate collector bought the place out from under us and showed us the road.... We relocated to a huge old industrial scale factory compound on North C Street, which required tons of demolition. There was a huge crew of former artist tenants, friends, supporters and volunteers who put in thousands of human hours helping to construct some 30+ studios... and as in the first place, without their support HORSECOW 2 could have never existed on such a grand and yet underground scale... It was an amazing culture factory that functioned for a few years until the city inspectors red flagged us after the cops had busted us for having the now legendary “PINK PARTY....” After we lost HORSECOW 2; as it was referred too, we relocated yet again to a great place on the banks of the Sacramento River. HORSECOW 3 was the best yet, until we were kicked out by the city because of a small fire two years later in 2009. DEDICATION TO MY GREAT HORSECOW PARTNER IN CRIME and Brother, ALLEN DENAULT, WHO CHOSE TO LEAVE EARTH IN 2016... you are missed.